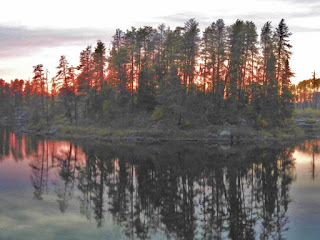 A fleeting sunset flamed through a ragged stand of jack pines across the bay. Patchy clouds provided just enough substrate to catch the color, and the faint breeze barely ruffled their reflection on the lake. 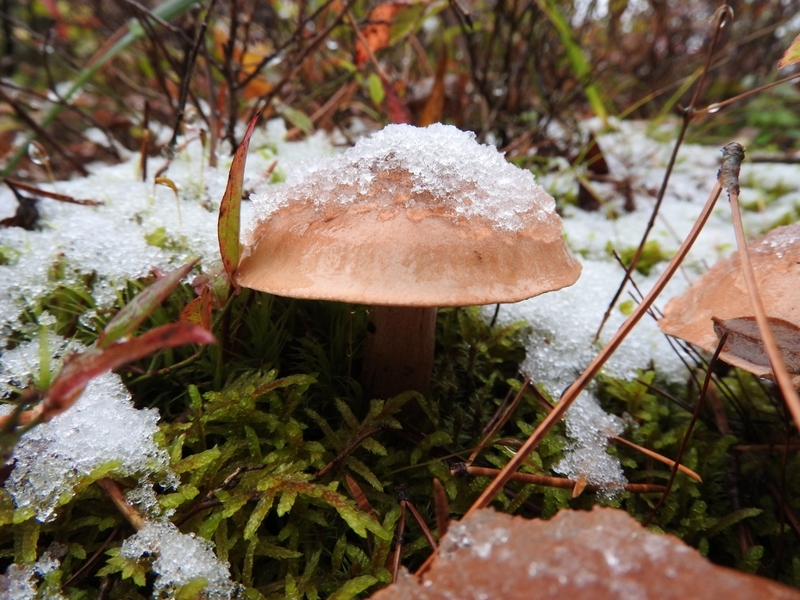 A biting chill in the air confirmed a more challenging forecast ahead. Here, on a classic, rock knob campsite in the Boundary Waters, we perched above a scene of rugged beauty. 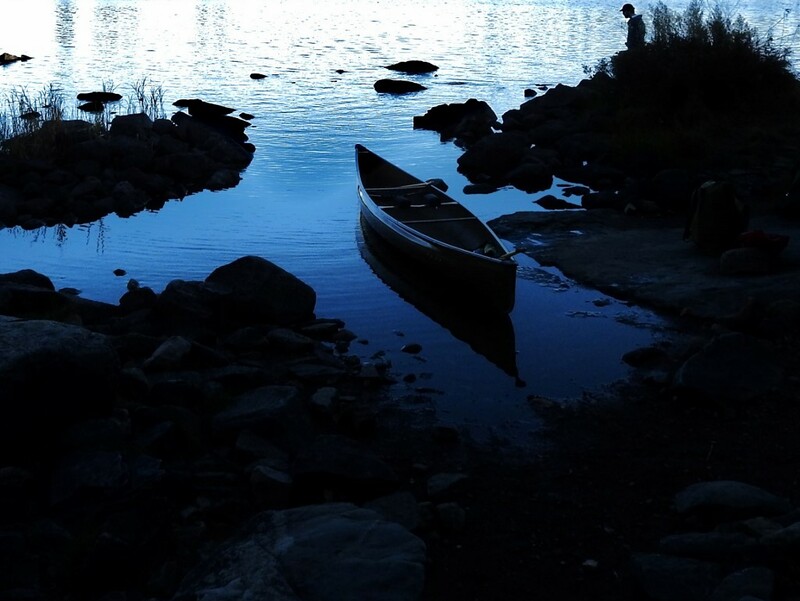 A small campfire, composed mostly of jack pine twigs laden with tightly closed cones, crackled softly against the descending dusk as I pulled a book out of my portage pack. For this trip, I’d chosen Open Horizons, Sigurd Olson’s autobiography, which is filled with just as many lyrical scenes and philosophical meanderings as his other books. I read the first lines aloud. “The Pipes of Pan sound early before the sense of wonder is dulled, while the world is wet with dew and still fresh as the morning.” And before I could begin the next sentence, a sweet, tooting call floated across the bay. The first time I heard the regular, almost mechanical, song of a saw-whet owl, I thought it was a car alarm or back-up beep. I learned my lesson quickly, though, and now perk up my ears on the rare occasion of this simple serenade. Saw-whets are tiny owls, only as big as a robin, who are nonetheless tough as nails. They breed in the boreal forests of southern Canada, and the conifer forests of the northern and western United States. 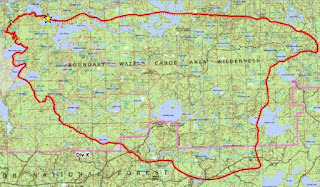 They are variably migratory, with some owls overwintering in their breeding territories, and others, especially from the far north, heading south. Their peak migration tends to coincide with leaf-off. This guy was right on time. 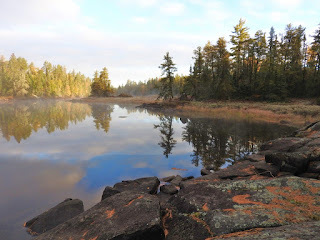 This late fall trip was one of the quietest I’ve experienced in the Boundary Waters. Few other hardy souls braved the cold snap. Many birds had either migrated or fallen silent. The sounds we did hear, though, seemed more significant in their isolation. The weather did improve a little by our final day, and we enjoyed a calm, sunny afternoon listening to the clear whistles of a couple of gray jays, the chirping of an eagle, and the low, wild roar of a rapids in the narrows. That peaceful afternoon faded into one of the quietest nights I’ve ever spent in a tent, followed by a crisp dawn with every leaf edged in lacy frost. The lake steamed silently as we made breakfast, and a flock of geese chattered amicably in the distance—their conversation slowly drifting southward. Not in a hurry to end our trip, we sat idly watching the mists swirl, our empty oatmeal bowls forgotten. In the absolute calm, I began to notice an occasional soft rustling sound. 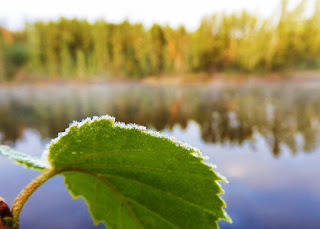 All around our campsite, birch leaves were detaching one-by-one and drifting to the ground. Not a whisper of breeze disturbed them, but perhaps the weight of the white rim of frost was enough to break them free. Brilliant blue sky and abundant sunshine greeted me at the Cable Community Farm. I’d been waiting for this—a perfect day to dig potatoes! Shovel, garden fork, and boxes clattered cheerily behind me in the little red wagon as it bumped over uneven paths. 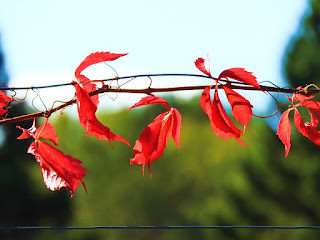 Stopping to open the garden gate, I took a moment to gaze appreciatively at the scarlet leaves of a Virginia creeper vine that had wound its way along the deer fence all summer. A few weeks ago I admonished Albert Camus for thinking that fall needed to be a “second spring when every leaf is a flower," but Virginia creeper is a different case. One botany website describes its flowers as “insignificant.” Ouch! Honestly, though, I’ve never noticed the flowers. A quick search on Google Images shows that they are actually quite pretty, in a tiny, spritely way. The five-parted flowers are deep burgundy and pale cream, and grow in a grape-like cluster, eventually ripening into blue-black berries that are eaten by birds, mice, and other small mammals. Although, how much does their beauty count if you don’t ever see it? I just put a note in my calendar: next year, I’ll remember to look! 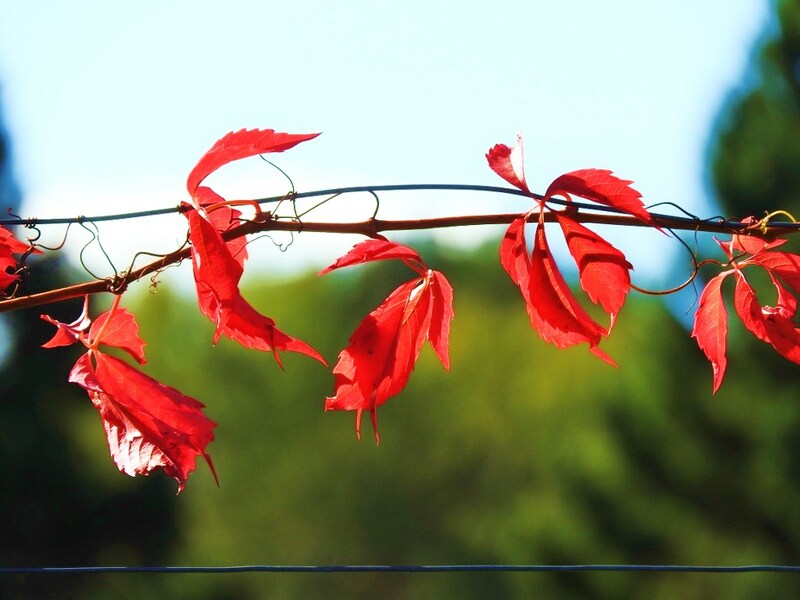 Virginia creeper’s fall colors more than make up for its inconspicuous July blossoms. Its starbursts of five gloriously vibrant red leaves (palmately compound leaves, technically) dominate all my memories of the plant. Growing up, we admired its color annually in the old fencerow below the house. A line of elm trees was dying and decaying in quick succession, and each tree was draped in more of the elegant vine than the last. 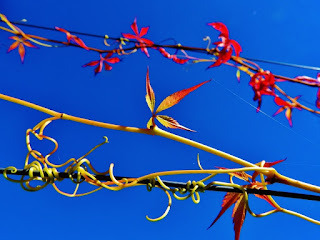 Those elm trees had bigger problems than a colorful vine, of course, but in some cases Virginia creeper can thread itself throughout the branches of a tree so thoroughly that it will shade the tree’s own leaves to death or add enough weight to hasten its downfall. On non-living substrates, like buildings, Virginia creeper is reported to be less damaging than non-native, invasive ivy. English ivy climbs using aerial root-like structures—appropriately called holdfasts—that wiggle their way into nooks and crannies and support themselves using adhesive nanoparticles. The holdfasts are exceedingly hard to remove, and excess moisture trapped against the wall can cause damage. Perhaps because it is native, Virginia creeper isn’t quite so disparaged as a climbing nuisance. For one thing, it provides valuable habitat and hiding places for many small critters. The structure of its “holdfasts” also makes a difference. 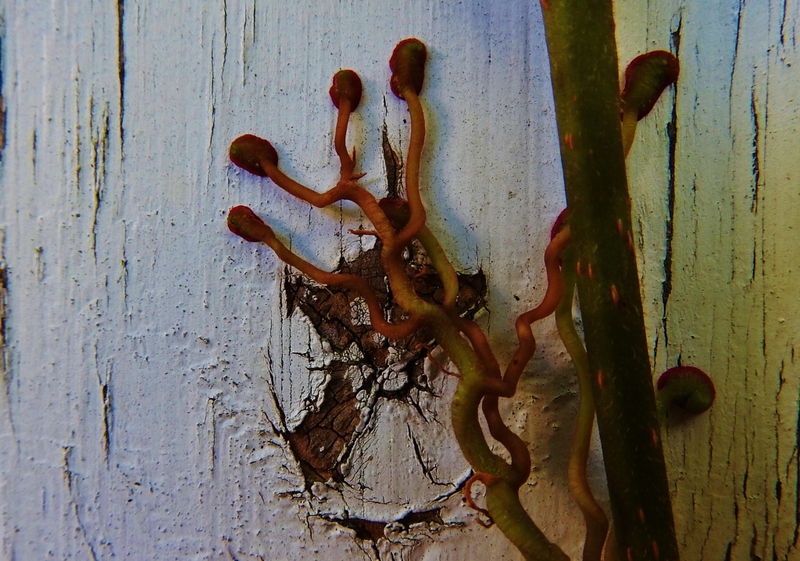 Its tendrils are tipped with tiny suction cups that flatten against the substrate and use the plant’s version of two-part epoxy to glue them securely in place. This structure eventually becomes woody and very weather-resistant, but is reportedly less damaging than ivy’s penetrating rootlets. While the berries are toxic to humans and rubbing the stems or leaves on your skin may cause irritation, Virginia creeper is much less noxious than its most common look-alike. Especially when young, Virginia creeper is easily confused with poison ivy. While we all know the “leaves of three, let it be” rhyme that reminds us of a key characteristic of poison ivy, the five leaves Virginia creeper often unfurl sequentially. This means that at some point in the development of new leaf clusters they may only have three leaflets. Looking at the entire plant will help you make the correct identification. Another mnemonic I just learned is “if it’s hairy, be wary.” This refers to the veritable fur of aerial rootlets that covers a poison ivy vine. 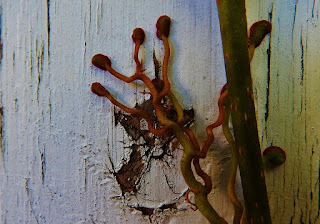 Virginia creeper has those tendrils tipped with suction cups, but not in a density that would make it look hairy. 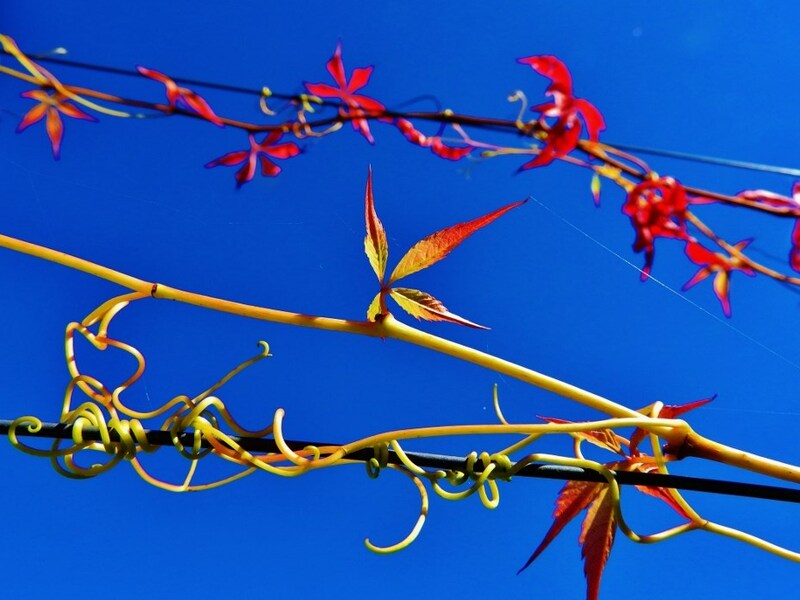 I think we’re all pretty happy that it’s Virginia creeper and not poison ivy that’s twining itself along the deer fence at the Cable Community Farm! A couple hours later, the little red wagon was once again bumping through the gate and under the glowing red garland of Virginia creeper. I was happy with my full box of purple potatoes, but overwhelmed by the 62 squash and pumpkins I’d also harvested from my garden plot. After loading it all in my car, I straightened my back, grabbed my camera, and went back to try and harvest just a little bit more of this perfect fall day. Water still dripped from the trees onto saturated duff, but blue sky peeked shyly through the clouds. Tired of the rain, my parents and I had taken advantage of a short break to go for a walk. Partway up the gravel road I followed a couple of mushrooms into the woods, and then looked up. 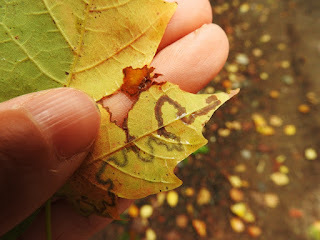 Just above my head dangled a yellow and green sugar maple leaf with a squiggly line through it. Immediately enamored (who wouldn’t be? ), I plucked it down for a closer look. You may not think that animal tracking extends to insects, but you can use the same process of looking for clues that eventually tell a story. 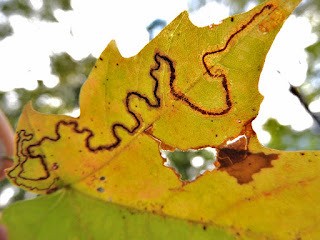 The squiggle on this leaf was typical of trails left by leaf miners, a group of insects (including moths, sawflies, flies, and beetles) whose larvae feed on the insides of a leaf between its “skins.” Some internet research and a quick email to Charley Eiseman, author of the fantastic resource Tracks & Signs of Insects and Other Invertebrates, and the “BugTracks” blog, turned up a narrative we can all relate to. 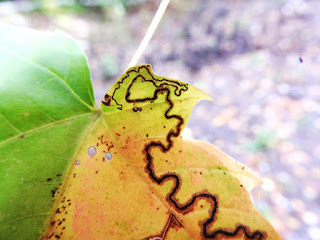 The story begins near the base of the leaf, where the trail of the leaf miner starts out narrow, about the width of a felt-tipped pen. The line itself is composed of a dark center stripe and paler, translucent edges. 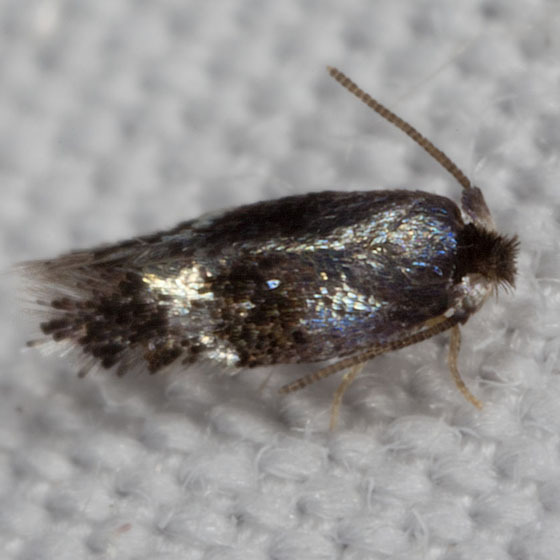 It records the growth—essentially the childhood—of a moth larva of the species Glaucolepis (Trifurcula) saccharella. The egg was laid earlier this summer, maybe about a month ago, by a tiny, brown-and-white moth—wingspan 4 mm. The larva hatched, burrowed its miniscule body in between the upper and lower epidermis of the leaf, and began to eat. What is there to eat between the skins of a leaf? A juicy substance called mesophyll fills this inner space. It is full of chloroplasts, the green engines of photosynthesis. Like a mountain path, the narrow trail of the leaf miner scribed switchbacks in the lowest lobe of the leaf near the petiole before widening and flowing like a river toward the leaf’s tip. 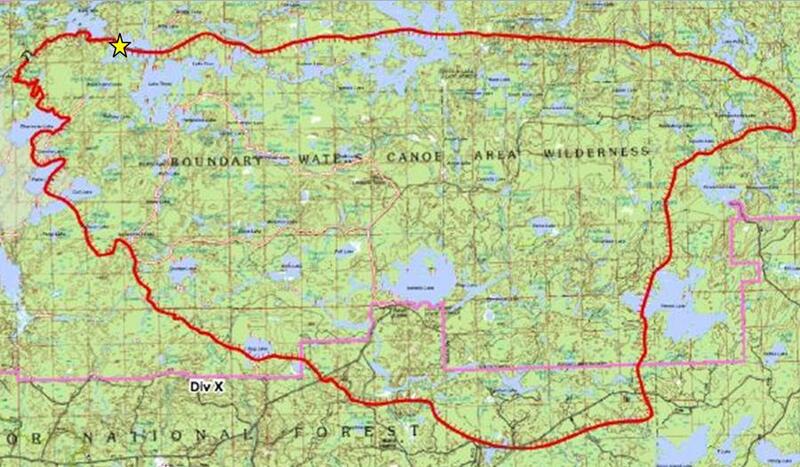 It was fascinating to follow that widening trail and imagine the larva growing bigger as it fed. When I read that, you can bet I added “watch a leaf miner larva at work” to my bucket list! Just before the end of the mine, its color changes drastically. I noticed it first on the LCD screen of my camera. I had just taken a photo of the leaf backlit by the sun. Most of the mine lit up beautifully, like a stained glass window. Near the tip of the leaf, though, the mine around the frass line became completely invisible! Turning the leaf over, I noticed that the color on the back side also changed drastically at that point. For most of the mine, it was apparent that a layer of leaf was more intact on the lower side of the mine than the upper. Then, for the last stretch of the mine, the insides of leaf seemed to be completely hollowed out. The frass line appeared thinner and straighter, too, like the path of someone on a mission. My hunch is that on the final day before its metamorphosis, the larva suddenly became a ravenous teenager and started eating everything in reach, and eating it so fast that the frass line stretched thinner, like a line from a pen swooped lightly across a page. Finally, maybe a quarter inch from the end of the mine, the frass line ends. The mine continues as a transparent section of leaf, missing all its green. This, Charley confirmed for me, represents the length of the larva—frass marking one end, un-eaten leaf marking the other end—just before it popped out of the leaf, dropped to the ground, and formed a cocoon to overwinter before completing its metamorphosis to a moth next spring. “Watching” the process of this larva growing bigger, and bigger, and finally leaving home to metamorphose reminds me of all the little old ladies I grew up with who would pinch my cheeks lovingly and admire how I’d grown. Then they’d hold up their thumb and first finger about an inch apart and exclaim “I’ve known you since you were this big!” If I could find that tiny larva, now wrapped tightly in its cocoon, you can bet I’d pinch its cheeks, too! After all, I feel like I just watched it grow up before my eyes.